Timber carriage houses or a cart lodge are a great option for people who don’t want to get out of their car in bad weather to open up the garage doors before parking their car. Just drive your car straight in and your done. We bespoke manufacture our own carriage house garages to the design that suits your needs. You can also add workshop storage space with doors or an open log store area to these buildings to store all of your garden machinery if required. Tanalised treated featheredge overlap wall boarding with an onduline roof covering. Traditionally these types of buildings where used as a coach house or cart shed so they tend to go well with farms and country houses. We can also make timber carriage houses with shiplap wall boarding for a more contemporary look. 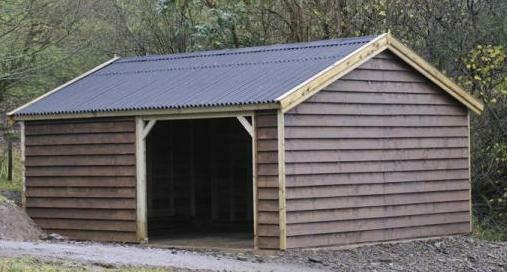 We can supply these wooden outbuildings with a higher pitch to take tiles or slates if required. They can be custom built to the design you require, you can add a partition dividing wall and extra access doors where required.